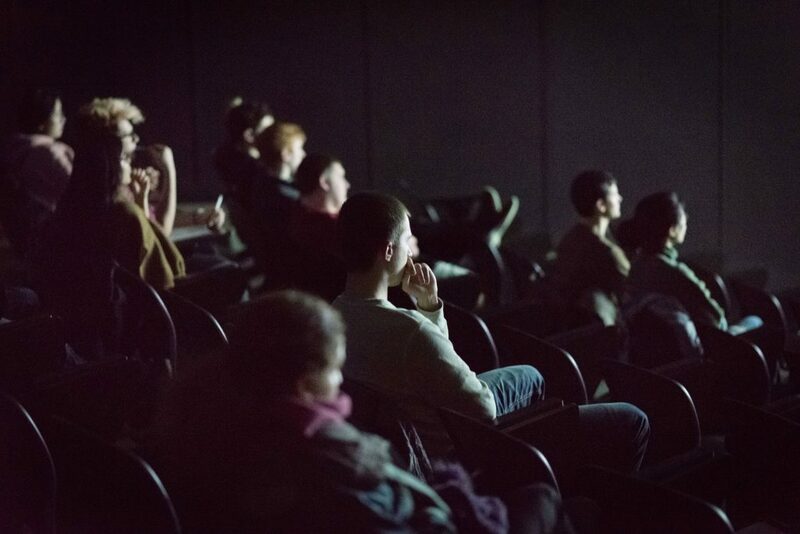 Pipe Dream Archives In this photo from 2016, attendees view a Harpur Cinema screening. This semester’s film series will begin this weekend with a screening of “Visages Villages” in the University Art Museum. Harpur Cinema will begin its spring 2018 series this weekend. The series, which is run through the cinema department, is organized by programmers Chantal Rodais, a professor of cinema, and Tomonari Nishikawa, an assistant professor of cinema, with logistical support from Kathy Horton, the department secretary. This semester’s theme is “A Curious Lens,” which, according to Rodais, is all about the human experience. To kick off the semester, “Visages Villages,” a French film directed by Agnès Varda and JR, will be screened on Friday and Sunday nights, both at 7 p.m.
She said that the process for picking the theme for the semester came after selecting the first film. “[Varda’s] cinema is beautiful cinema — it’s using cinema as an art form for reinventing itself constantly,” Rodais said. She also explained that the current exhibition in the museum’s main gallery, “Beautiful Pictures: Peter Guttman ‘76,” serves as an appropriate echo of the theme of landscapes the series is highlighting this semester. “It creates an encounter here, in the world of art, and I love that,” she said. According to Rodais, she and Nishikawa follow the films being shown at international film festivals, like the Cannes Film Festival, and then narrow those options down to those that best suit the needs of the department’s students. Other selections for this semester include “Dragonfly Eyes,” directed by Xu Bing and “God’s Own Country,” directed by Francis Lee. Students are at the core of Harpur Cinema, according to Rodais. Cinema students serve as projectionists, ticket vendors and graphic designers. They also have the opportunity to have their films be considered for inclusion in the screenings. Beginning last semester, each feature film has been preceded by a short film by a student in the cinema department. Christopher Woloshyn, a junior double-majoring in mathematics and cinema, created the film “sin(x); cos(x),” which will open this weekend’s screenings. He said that his film is inspired by a sense of nostalgia. Particularly since the closing of the Art Mission and Theatre in Downtown Binghamton, Rodais said that Harpur Cinema has become more earnest in its mission to bring world-class films to the area. She said that the series is open to anyone, though at its core, it is about providing opportunities for cinema students. “It’s the idea of bringing to campus good material, rich material that is also going to be solid material for our students to write papers about and to expand their horizons,” Rodais said. Harpur Cinema screenings are held on Friday and Sunday nights throughout the semester, typically in Lecture Hall 6. Tickets are $4 at the door. The complete schedule is listed on the cinema department’s website.